You’ve planted things with the word “butterfly” in the name: butterfly bush, butterfly weed, and the pincushion flower ‘Butterfly Blue.' A few butterflies do seem to flit by, but what if your garden is still more of a stopover than a destination? By learning more about butterflies, the plants that attract them, and their survival needs, you can increase your garden’s butterfly allure considerably. The flowers you choose to install in your butterfly garden are likely to be classics that your parents or grandparents grew. Growing these heirlooms preserves genetic diversity, honors old-fashioned garden style, and connects you to your ancestors. It also allows you to propagate your garden by saving seed. Traditional flowers that you will see repeatedly in butterfly gardens include brightly colored plants with shallow blossoms that allow easy nectar access. 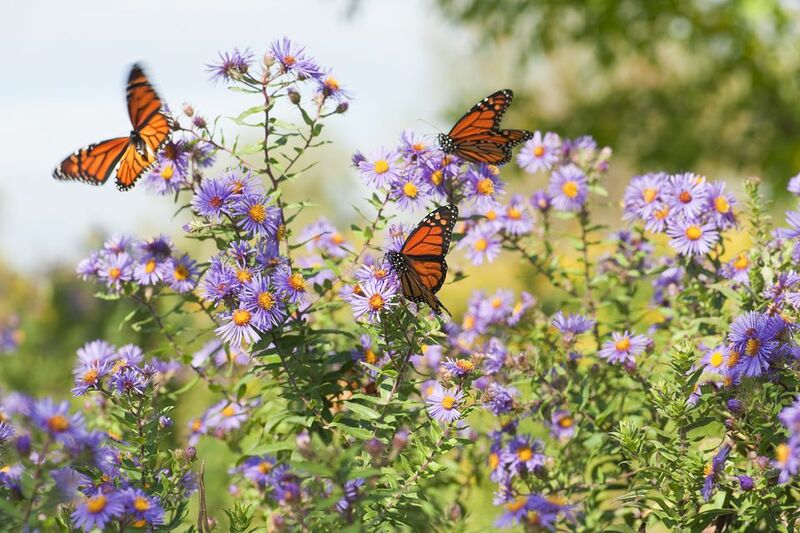 Popular butterfly perennials include milkweed, coneflowers, hyssop, asters, and liatris. Shrubs add a structure to the landscape while nourishing butterflies, so include some viburnum, sweetspire, and elderberry. These plants and shrubs all thrive in full sun, which butterflies need to maintain their metabolism. Use a mix of annuals and perennials to prolong blooming time. Flowering containers allow you to exchange plantings during low-blooming lulls in the garden, like late spring and late summer. Use a combination of window boxes, patio containers, and hanging baskets to help create staggered blooming heights in the butterfly garden. Stick to nectar-rich flowers like pentas, cosmos, lantana, petunias, and zinnias instead of sterile hybrid flowers to ensure a steady supply of nectar. Include not only a variety of colors, but plants of differing heights to attract more butterflies. A short row of flowering bedding plants may look attractive to homeowners, but it doesn’t satisfy the needs of some butterflies. In nature, butterflies fill specific feeding niches by focusing on flowers at certain heights. By including flowers that grow at a range of heights, you can not only achieve a professional-looking border, you will attract a greater variety of butterflies. For example, Tiger Swallowtails seek tall flowers like Joe Pye weed and honeysuckle vines. The Least Skipper and Little Yellow butterflies prefer flowers closer to the ground, like lavender, dianthus, and asters. Many butterflies are very specific about which host plant they will lay their eggs on. Sometimes they seek out plants in a particular family, and sometimes their caterpillars will dine on one plant and one plant only. If you intermingle attractive host plants with nectar rich plants in your flower garden, you may find yourself fostering one butterfly generation after the next. Don’t worry about extensive caterpillar damage on your host plants; unlike some caterpillars that are voracious garden pests, butterfly caterpillar feeding rarely causes death or stunted growth on healthy host plants. Aster flowers are an important source of nectar for migrating butterflies in the fall, but before that, the larvae of the pearl crescent butterfly feed on its foliage. Monarchs depend on butterfly weed and other plants in the milkweed family to provide them with the toxins that make them unpalatable to birds and other predators. The showy zebra butterfly, a Florida and Texas resident, feeds its babies exclusively on the foliage of the passionflower. If you reside in the Eastern half of the United States, you may attract the iridescent Eastern tailed-blue to your garden with a host planting of sweet peas. Butterfly houses look like wooden blocks punctuated with tall, narrow slots, presumably to shelter butterflies from predators and bad weather. Have you ever seen a photo or video of swarm of butterflies emerging from this butterfly apartment house in the morning? Probably not. Unfortunately, a prefab butterfly house is more likely to become the future home of a paper wasp colony than it is to shelter butterflies. Butterflies do need shelter from wind and rain, but you don’t need a fancy shingled house to protect them. Take your cue from nature, and provide them with a simple log pile in a corner of the yard. Butterflies will use this natural shelter to roost at night, or even to hibernate over the winter. In addition to the spaces between logs, small butterflies can creep between gaps in the bark. If you wish to make the shelter more cozy than a rustic log pile, you can cover the pile with a tarp, which will help the insects stay dry during downpours. In spite of your best efforts to maintain a garden that blooms from spring until frost, there will inevitably be some times when a butterfly’s favorite flowers are scarce. You can continue to draw butterflies to your garden during this time by focusing on species that spend little time seeking nectar. Hackberry butterflies in particular relish overripe fruit, so you can attract them with dishes of peaches, pears, and bananas that are past their prime. Fermented beer or molasses can act as the condiment on the fruit main dish, proving irresistible to species like the Question Mark and Red-Spotted Purple. Replace the fruit frequently to discourage wasps and ants from taking over the buffet. You can also cover the fruit with a window screen, which butterflies can bypass with their proboscis but will block wasps. Butterflies seek shallow puddles in the garden not only as a source of drinking water, but also as a way to obtain vital minerals. In fact, the Cloudless Sulphur and the Sleepy Orange butterfly may congregate en masse in muddy areas or bog gardens. Look for this puddling behavior in the hottest part of the day, and keep your soil free of chemicals that can harm sensitive butterflies. A shallow dish filled with pebbles or sand and water can act as a valuable drinking station on hot days. When it comes to pest control, butterfly gardeners must tread lightly. Most pesticides will harm or kill butterflies (as well as other beneficial pollinators like bees and parasitic wasps). Even organic pest control options like insect soap or neem oil can kill butterflies or disrupt their feeding and mating habits. However, this doesn't mean you have to hand your flowers over to the aphids. Minimize pesticide effects by shielding flowers from sprays and powders. Only use pesticides to treat insect outbreaks, not as a preventative treatment. Finally, try non-pesticide insect controls, like floating row covers, jets of water to blast away small insects, and hand-picking for large insects like beetles.